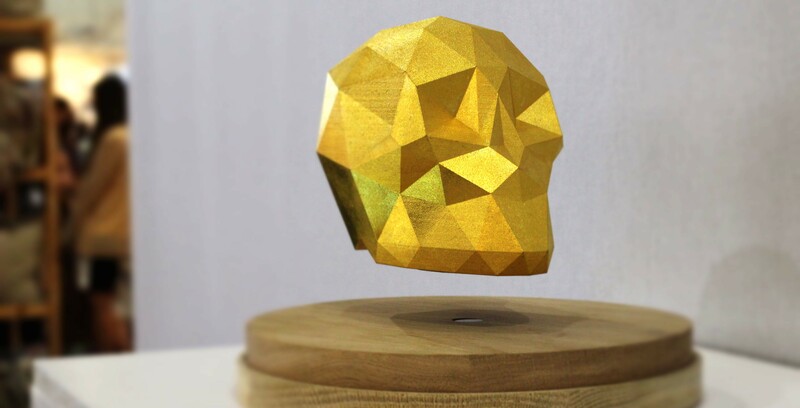 The design company Ao Gitsune recently released a new amazing creation: a levitating skull, which has been 3D Printed to better meet the project’s creative needs. Of course, the printed part was made through Sculpteo’s services. Perpetually floating in the air, this piece of art is a beautiful metaphor for the boundlessness of the human imagination. 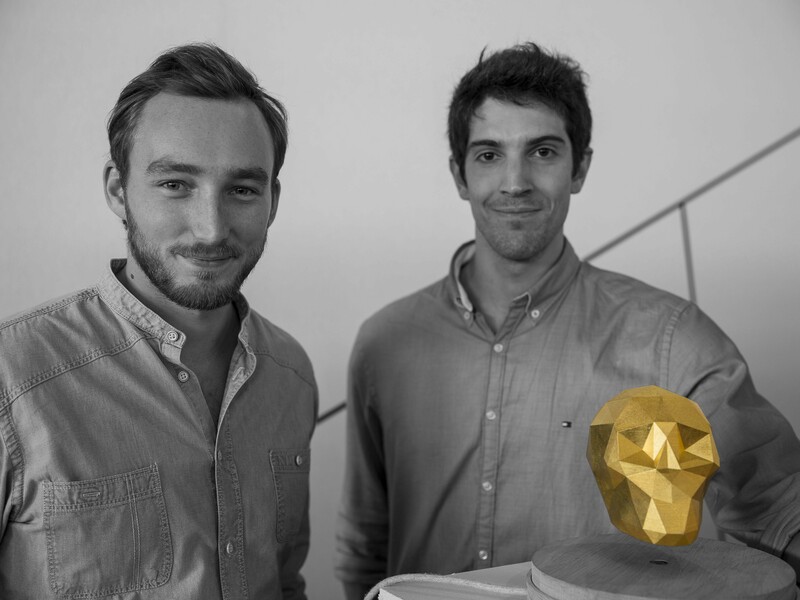 We got a chance to speak with Guillaume Kuntz and Arthur Clement, designers of Ankou, who told us more about their 3D Printing Success story. Based in Paris, the brand Ao Gitsune – which means “blue fox” in Japanese – knows the 3D Printing process. Their aim is to create home furniture, such as bathroom objects, office accessories, or a range of lighting products, and almost all of their products were prototyped with a 3D printer. Additive manufacturing is the perfect solution to work out their new creations, as it is for smaller companies. The Ankou project is different more than just a means of prototyping, as 3D Printing has been used to produce the final versions of the levitating skull, thus bringing life to its designers’ ideas. 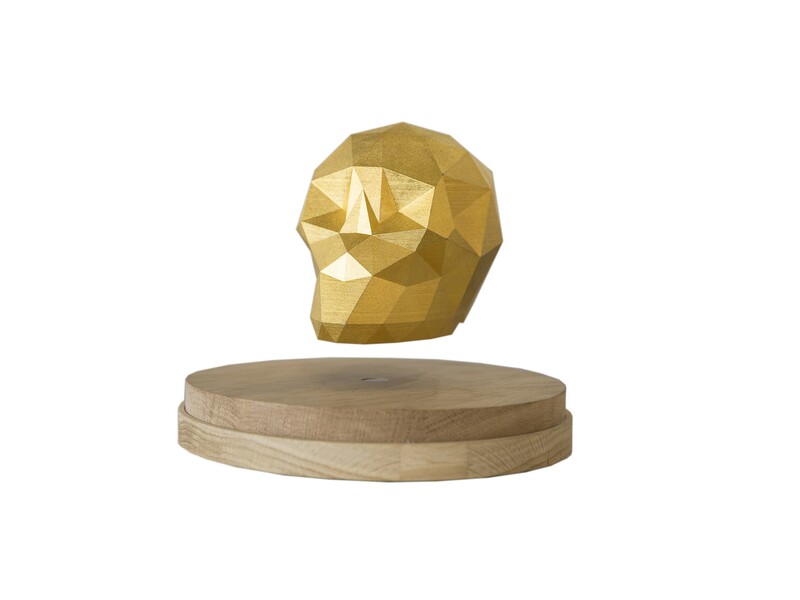 Everything started from an exploration of the concept of ‘modern vanity’ and some experimentations on electromagnetic levitation: “Levitation is one of the first absolute laws on earth, so powerful that it affects everything. It is very similar to passing time. We decided to use gravity as a metaphor for time. Being able to break away from the attraction is a subtle yet strong metaphor to show the ‘infinite’ power of human imagination against the relentless force of time. The little idea made its way, step by step – a challenge as magnetic levitation won’t allow design errors – gathering knowledge, skills and a lot of time” explains Guillaume Kuntz. In order to make it possible, Ao Gitsune’s designers first had to find a material light enough to meet the levitational constraints. Sculpteo’s polyamide material was perfect for that. Weighing in at about 0,9 g/ cm3, it allowed them to conceive a solution which is both lightweight and visually attractive. Using an SLS printer (Sculpteo uses either OS Formiga P100, P110, P395, and P730s) Ao Gitsune could produce their objects at a high precision. Their prints had a precision of 100 µm, and it even reaches 60 µm when Batch Control is activated. Beyond that, Sculpteo’s polyamide material allowed Ao Gitsune various finishing options. When using the right finishing method, polyamide prints can attached, painted, polished, and more. Sculpteo’s polyamide material allowed them to get the high quality finishes required to produce their fine pieces of art. Thats how Ao Gitsune attained such a beautifully gold gilded surface. For now a small serie has been produced, but more levitating skulls are to come, with different finishes and colors, more beautiful the ones than the others. As always, we’re pumped to be part of the making of such an incredible piece of art.